Of all the dishes, this is probably the same soup that the Thais ate 1000 years ago, before the introduction of the chili peppers and many other non-Thai vegetables. The vegetables are native and grown locally. The meat in the dish is fish which so core to Thai cooking. When we made this recipe 10 years ago, the availability of the ingredients was not what it is today. Loofah was unheard of. Now, we can get fresh loofah and lemon basil at farmers markets. For tum leung (as known in Thailand) tindora leaves or ivy gourd leaves are still not widely available. So, we adjust the recipe to reflect today’s availability. The soup is said to be good for nursing mother because it is supposed to increase milk production. But the soup is not reserved for nursing mothers. 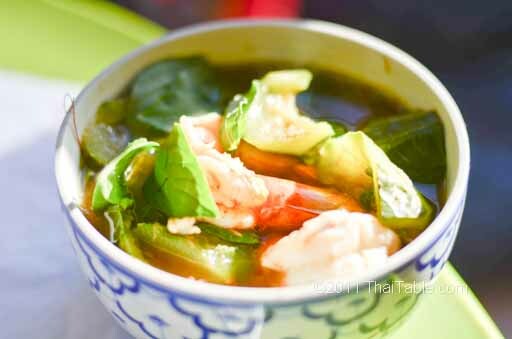 This is an everyday soup with simple ingredients available in Thailand, fish, shrimp paste, Chinese keys, ivy gourd (tum leung) and lemon basil. This recipe is made with dried shrimp. But fresh white fish or dried smoked fish is also used. You can also substitute bonito flakes for the dried smoked fish. Other vegetables that you can add are green beans, mushroom, kabocha squash and baby corn. But there is no way around the lemon basil. It makes the dish. Yellow flesh squash like delicata squash, butternut squash or acorn squash is a good option for the soup. Zucchini is good substitute for loofah. If you are using dried shrimps, soak them in water water for 10 minutes. If you are using fresh fish, boil the fish first. 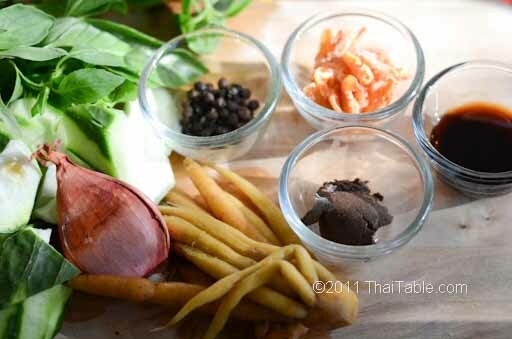 In a food processor or a mortar, grind peppercorn, shallots, shrimp paste, and dried shrimp/fish/dried fish together. Warning for using a food processor, peppercorn will remain whole. 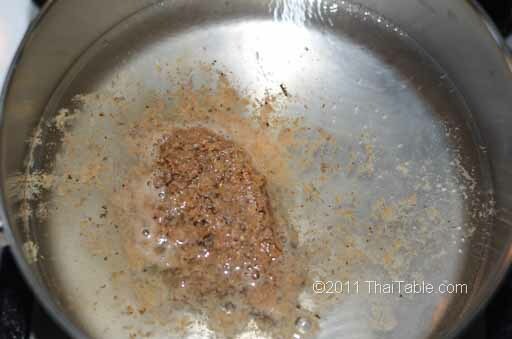 If I use the food processor, I use ground pepper instead of peppercorns. Cut loofah into thick piece at an angle. It should like a wedge of lime shape. Peel and devein shrimp. Clean and pick the leaves of lemon basil. Boil 2-3 cups of water. Add the mixture to the water. Let boil. Add the vegetables. When you are about ready to serve, bring the soup to a boil. Add lemon basil, tum leung (if use) and shrimp. Turn off the heat immediately and let sit for 2 minutes or so. Serve hot.